Title: The Light Didn't Shine Straight! Description: That's what Jonathan said when he got his prints. That, or it's a narrow gage version. Why else can't you see the trucks? Description: Making up trains with all possible haste after a minor derailment tied things up a while, 3539 fairly flies down through the switches. Description: NS train I45 on the GS&F district between Tifton and Valdosta. Title: NS 3539 on the Manassas local backs down the Old Main Line. Description: The Manassas local makes a rare move down the Old Main Line in snowy Charlottesville to deliver a car of fertilizer to Southern States. Title: More NS B32-8 Power On 212 @ 0903 hrs....Nice Sunvisors! Title: Ghetto Cruiser Leads NS 212 @ 0945 hrs. Description: 212 with the only remaining engine in the old UP scheme leading at 9:34AM. Description: NS intermodal 213 cruises west out of 'the hole track' around the curve through CP Burn with 19G pulling up out of Allentown Yard to pick up the conductor and conductor trainee. Description: To ATL she goes! 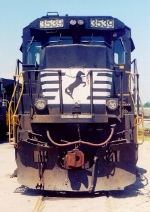 Description: 212 has some foreign power upfront in the form of a UP SD70M and a UP C44-9W. Description: NS 212 will hold the passing siding at CP Bound Brook until NS 21M passes it on the main at 9:52. Description: Approaching Bowden Yard. Non-safety cab motors have been popular on this train lately.